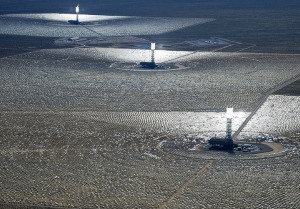 Could California’s massive Ivanpah solar power plant be forced to go dark? The Ivanpah Solar Electric Generating System is seen in an aerial view on February 20, 2014 in the Mojave Desert in California. and Alphabet Inc.’s GOOG, -0.58% GOOGL, -0.61% Google, uses more than 170,000 mirrors mounted to the ground to reflect sunlight to 450-foot-high towers topped by boilers that heat up to create steam, which in turn is used to generate electricity. But the unconventional solar-thermal project, financed with $1.5 billion in federal loans, has riled environmentalists by killing thousands of birds, many of which are burned to death — and has so far failed to produce the expected power. PG&E PCG, +0.16% is asking the California Public Utilities Commission for permission to overlook the shortfall and give Ivanpah another year to sort out its problems, warning that allowing its power contracts to default could force the facility to shut down. The commission’s staff is recommending that it grant the extension Thursday.